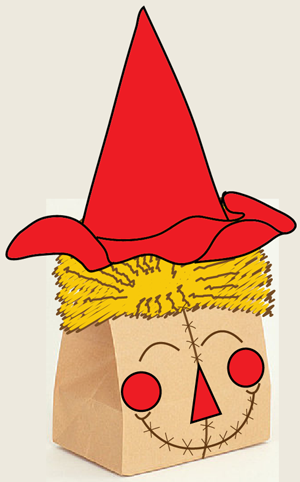 Scarecrows are a great fall character. You see them in fall all around corn fields to protect the corn from crows. Well, what fall holiday do the kids love more than any other??? Halloween, of course. 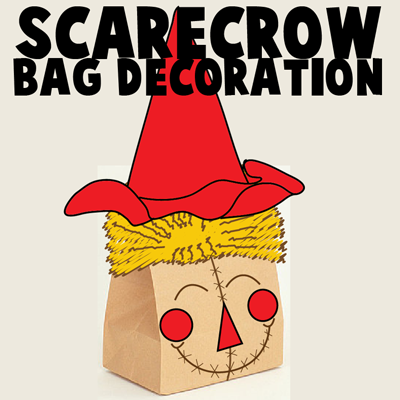 Here I will show you how to make a brown bag Scarecrow decoration perfect to display this Halloween season…. and why not even the entire fall season!! 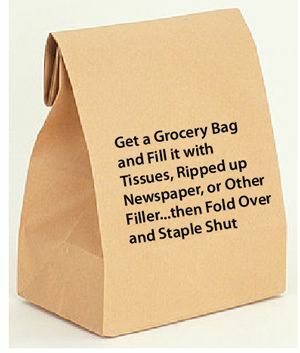 Get a grocery bag and fill it with tissues, ripped up newspaper or another type of filler… then fold over and staple shut. Draw a line thru the center of the bag… brown markers work well. Draw two circles for the cheeks and a triangle for the nose. 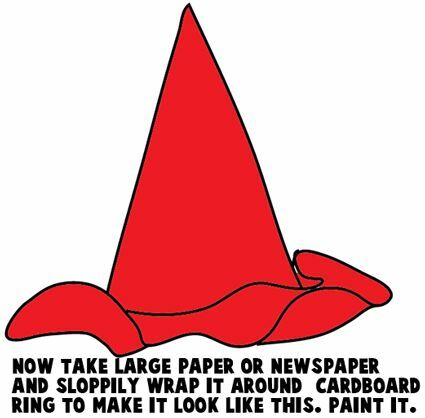 Use red marker or paint. 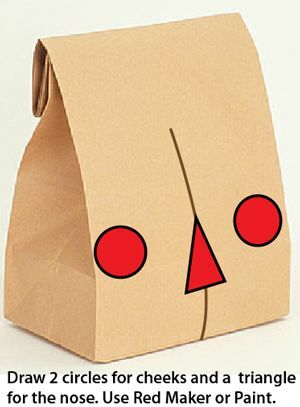 Draw a curved line for each eye. Draw a curved line for the mouth. 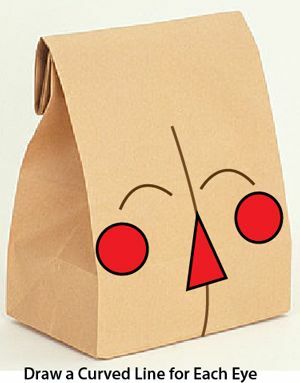 Draw ‘X’ shapes all over the mouth and center line. 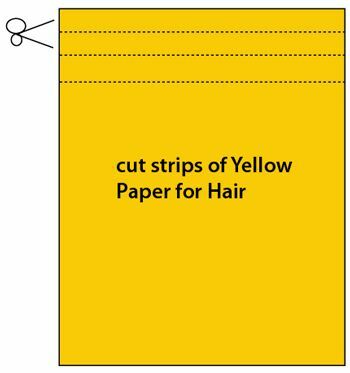 Cut strips of yellow paper for the hair. 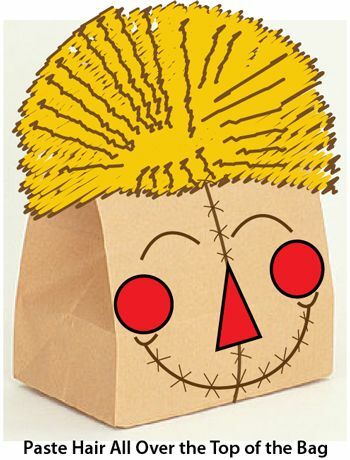 Paste hair all over the top of the bag. 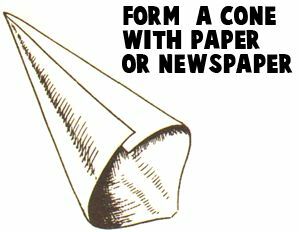 Form a cone with paper or newspaper. 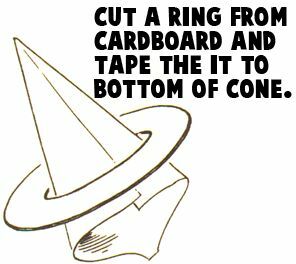 Cut a ring from cardboard and tape it to the bottom of the cone. 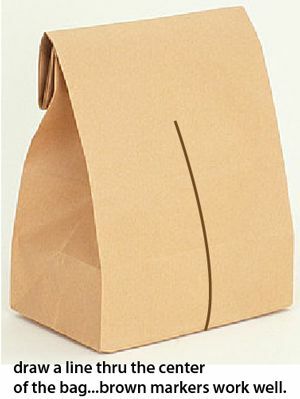 Now take large paper or newspaper and sloppily wrap it around the cardboard ring to make it look like this. Paint it. Ok, that’s super cute, right?! It is the perfect decoration for the fall Holidays… including Halloween. 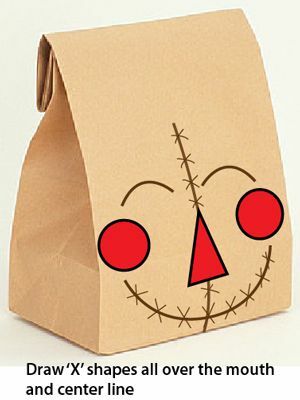 Your kids will love helping you decorate for the Holidays…. they will feel so proud.